Friday Finish and Paddle Day! 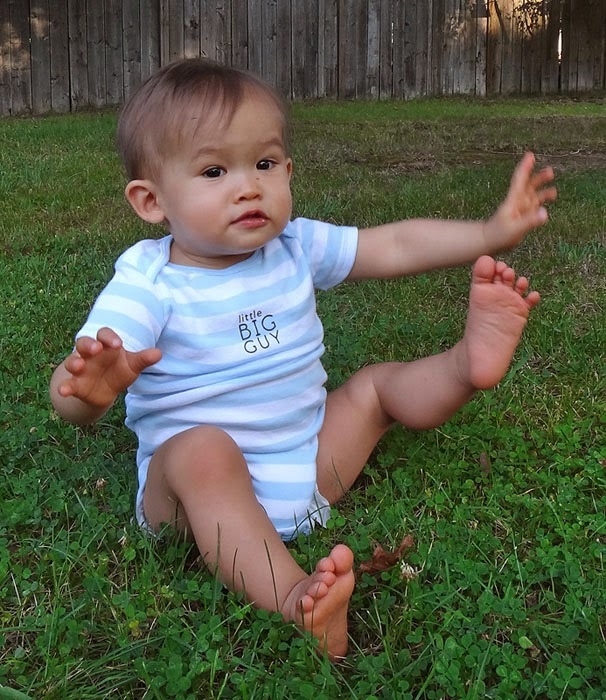 New Pattern and Giveaway Winner! It took me all week, but I finally finished my table topper. My friend Kelley sent me the piece and I decided to make it into a Christmas mat. I added the green border, which is fabric that she sent me, as well. The finished piece measures 26" x 17". I did the hand stitching with black pearl cotton. I antiqued it with walnut ink, that was diluted to a watery consistency in the bottle, so I could spray it on. I wanted to give it a light touch but enough to give it a slight aged look. Here is a closer view of the borders. I did stitches around all the inner and outer edges and for the skinny border, I added a zig zag stitch and tree shapes in the larger border. Nothing fancy, but a nice project to work on at night. I hope everyone has a wonderful holiday weekend. 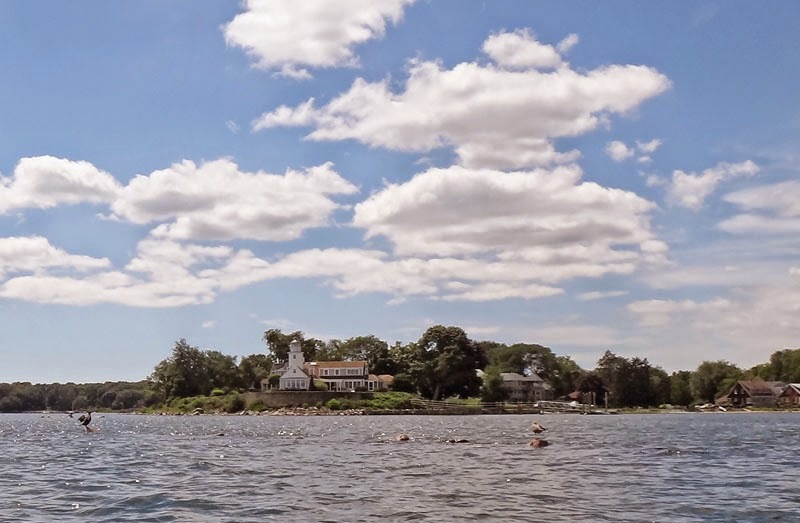 I am looking forward to the day after, when the crowds are gone and Bill will get some days off so we can enjoy paddling at our favorite places. Bill had to work another weekend, so no paddling this weekend. He did work a later shift yesterday so we took advantage of the extra time and nice weather and went for a bike ride. 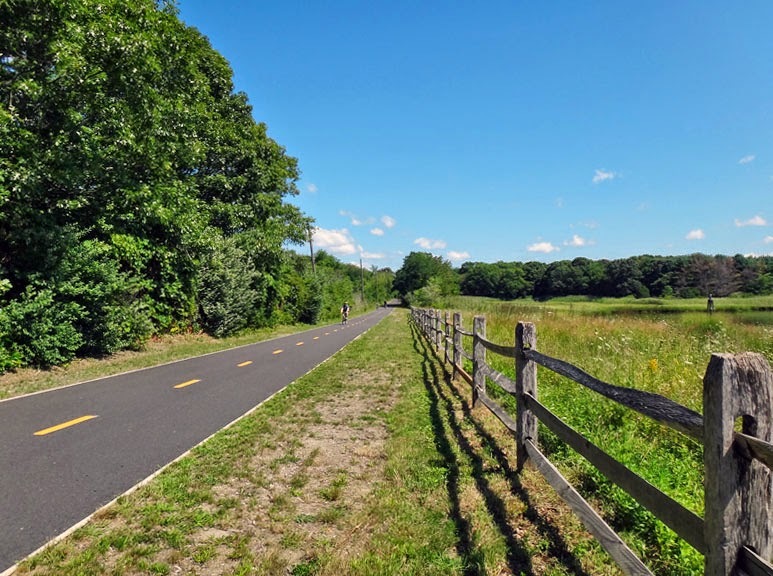 With heavy traffic from the beach traffic, it is nice to have a bike path close to home. The path starts in a shopping plaza but runs along the back side of the old base, so a tree lined hill blocks out most of the buildings. Past the base, it is a long stretch with coves on both sides. This is a nice area to stop and enjoy the views. The end of the path is worth the trip. You come out to a beach with views of the bay. I definitely plan on riding here more, during the week, during the fall months. Another slow week, I spent more time thinking about what to do, so I didn't start until later in the week. One project I started was an old topper that my friend Kelley sent me. 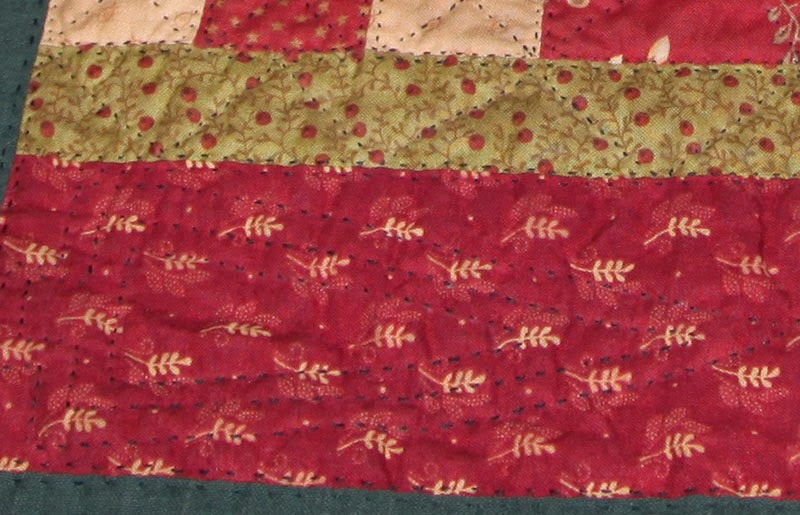 She made the top and I added the green edge for the border and binding. I thought the piece had a Christmas look so I can use it for the holidays. I was going to practice my machine stitching with it, but decided I needed a simple hand project to work on while I do other things. 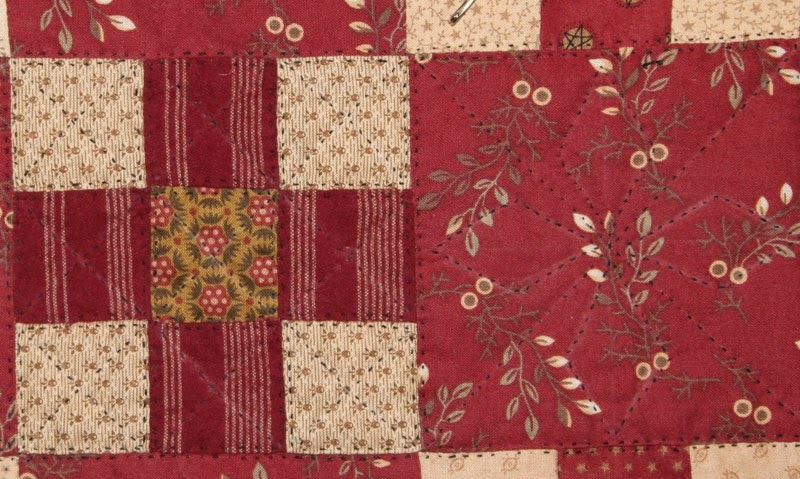 I am using pearl cotton on this one and a simple stitch in the ditch with an X in the middle for the smaller blocks. They are 1 1/2" in size. The larger block is 4 1/2" and I am doing a stitch in the ditch around the edges, then an X and in-between that I am doing a diamond shape pattern. I thought that it would be simple enough and give it a bit of a snowflake look. 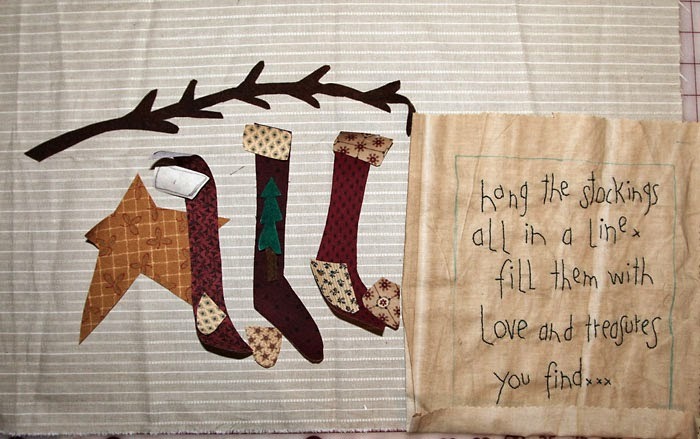 Another project I started is a Christmas piece called "Hand the Stockings", by Joann Mullay. My friend Karen has gifted me with her older patterns and I love using them, fun and quick to do. I have all the pieces ready to place and sew. I finished my table mat this weekend and love how it looks on the table. We got a slate blue couch and just having something that matches, really warms the area up. The table is really an old cupboard top that had a stained glass front, but that got broken and now it is used as a table top with shelves to put my things. This is the top, as is. I had to wash it to get rid of the chalk marks, yellow is not easy to get out. It shrank up and warped a bit, but fits the spot perfectly. The mat measures 23 1/2" x 13". I stuck the candle on top so you could see the colors. I have a reproduction pencil box that sits there and holds my scissors and other items. I decided it was too white and bright, so it got a walnut ink wash. I dried it in the sun and it got spotty, so I rinsed it down a bit and resprayed, then dried it in the dryer and now it has just the right aged look. The extra washing and drying, warped it more, but is is laying flat now, on the table. Here is a close up of the staining and my stitching. I used DMC floss, 2 strands of #612. A great color for when you want a lighter, primitive shade. This week I started two projects and finished one, well ….. almost. 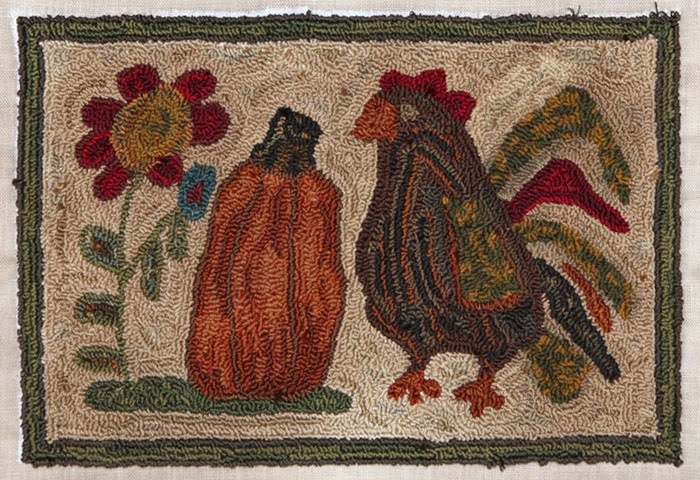 I made a punch needle from the latest issue of Primitive Quilts and Projects from a rug design by Tonya Robey. 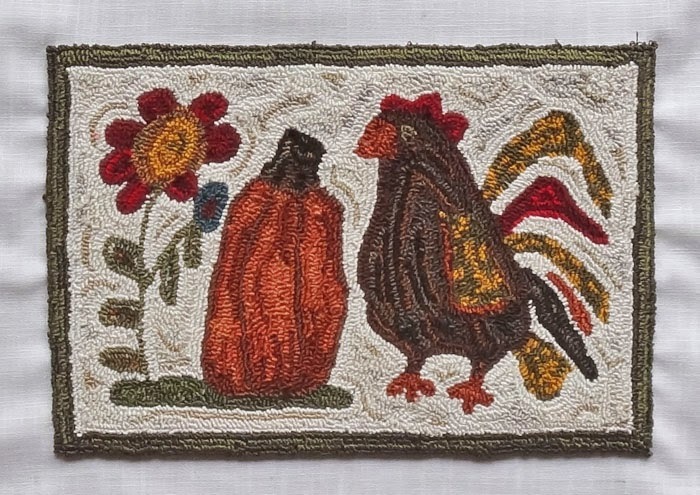 I think it will make a nice piece for the kitchen and I am thinking that I can make something with hangers and than attach it to that with double sided tape and change it out with the seasons. I used scrap floss from my box and some of it was over dyed. I am not sure on the green and orange shades, but I still have to antique it and I think that should tone it down and give it the look I want. This way, I will stain it first and if I don't like how it comes out, I can still take that part out and redo it. On the original design, there are flowers on the other side, as well. I did this with 6 strands of floss and a #2 height. Bill was on a trip and came home this week, but they are still busy at work, so he is working around the clock. The good thing is they have him coming in later, so we were able to get out today and go for a paddle. 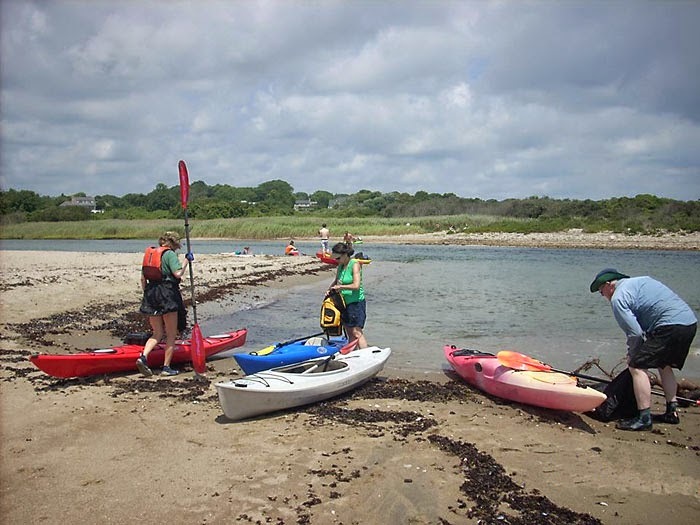 The tide was higher than usual so we could paddle all over the harbor without worrying about shallow areas. 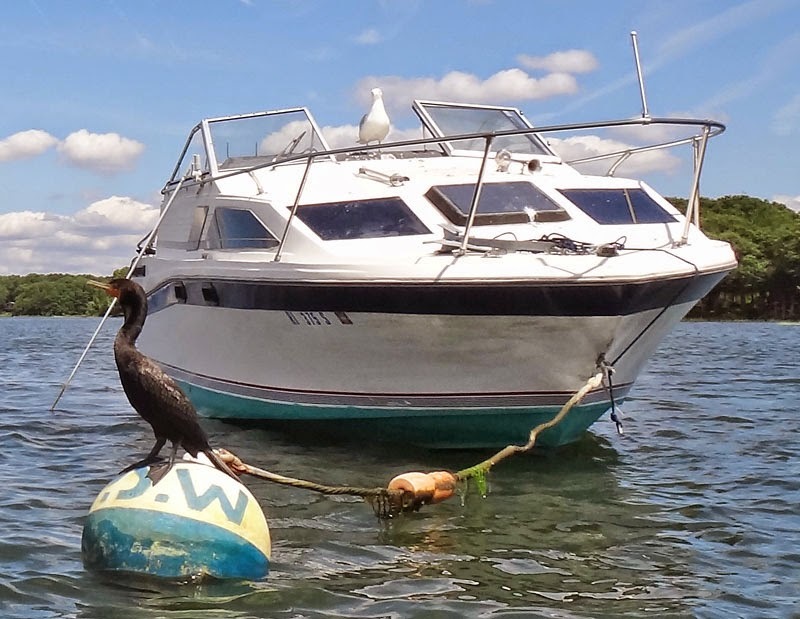 The birds lost their usual hangouts so they were all over the buoys and boats. I hate to be the owner of this boat, he is going to have a mess to clean up when he goes out this weekend. 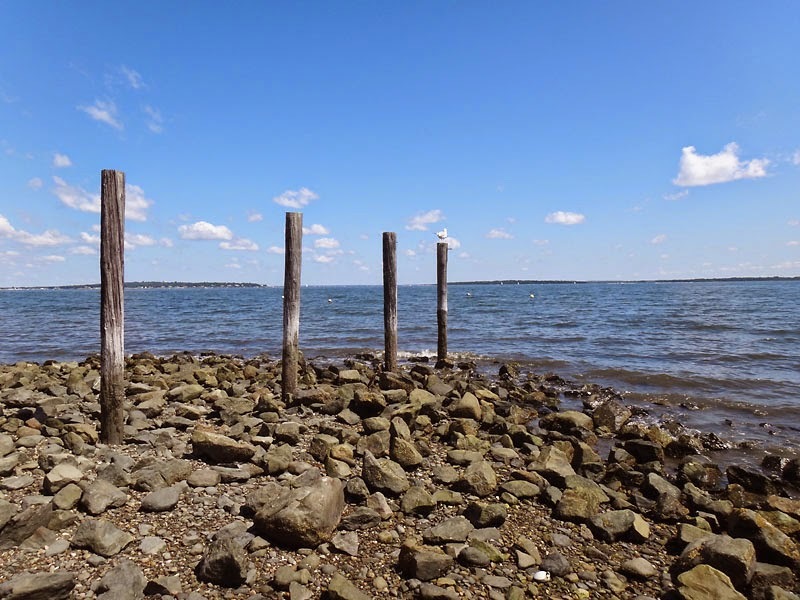 It was a bit warm for paddling in the coves, and I wanted to enjoy the breezes so we headed out to the bay. The water was so high, you could paddle over the rocks. 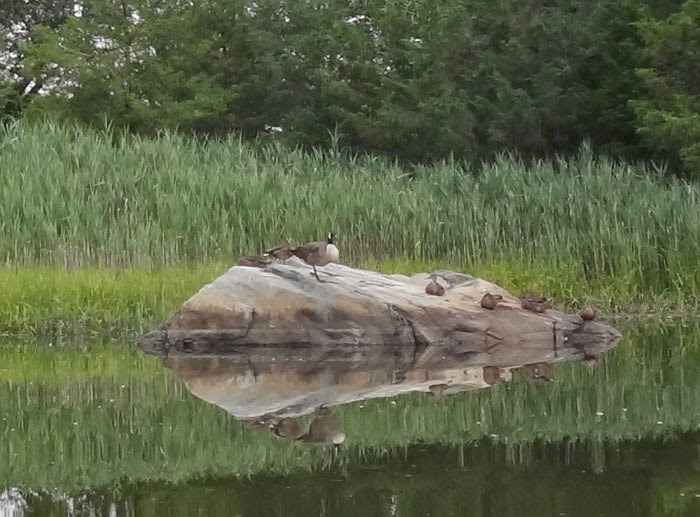 The birds didn't have many places to sit today. Usually this area has a line of rocks from the opening all the way to the lighthouse. 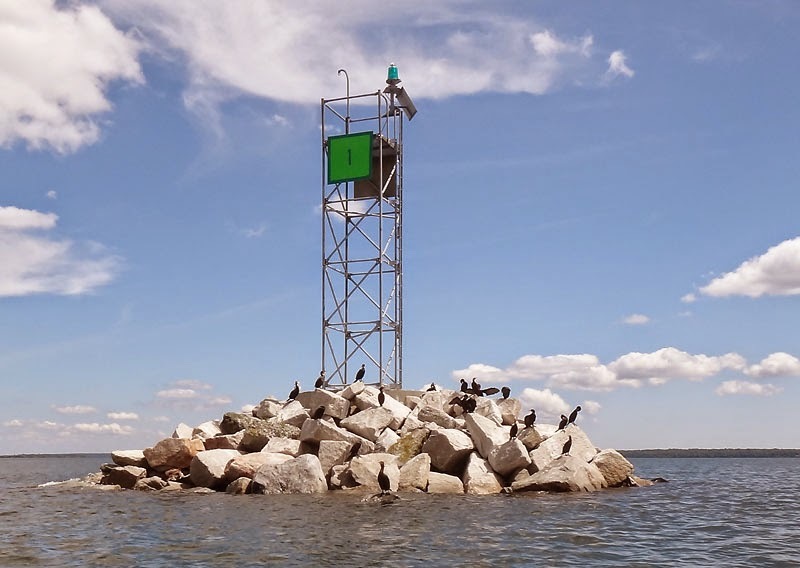 Some of the birds found a new place to hang out for the day. We paddled further out in the bay since the boat traffic was light today. 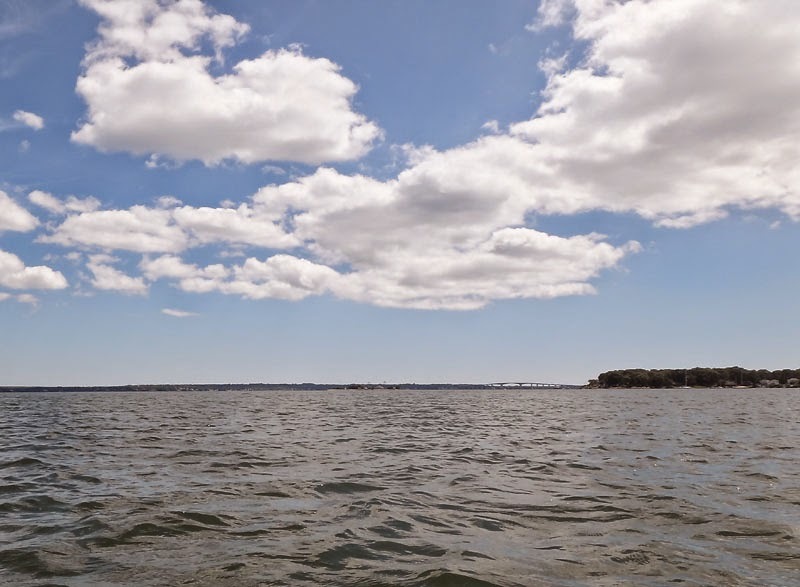 It was so nice to be out on the water and the fresh air was rejuvenating. To finish the day, we went into the town harbor. 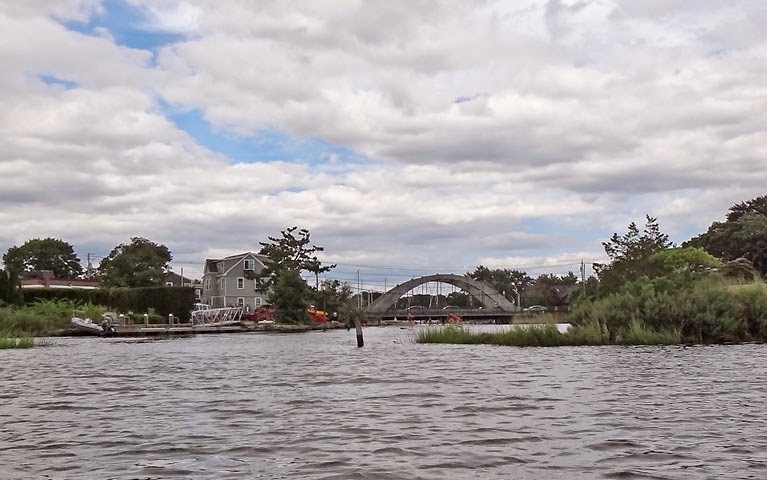 This is the old bridge, leading out of town. I hope everyone has a wonderful weekend and hopefully I will finish both of my projects this weekend. I hope everyone had a good weekend. We had beautiful weather but Bill is away, which means no one to carry the kayaks;) I was sick most of the week, so I couldn't do much anyways, but finally starting to get back to "my" normal again. I forgot to show you a photo of the penny back so you could see how I attached them. I did the pennies first, then I lay them on a piece of ticking in a triangle pattern. 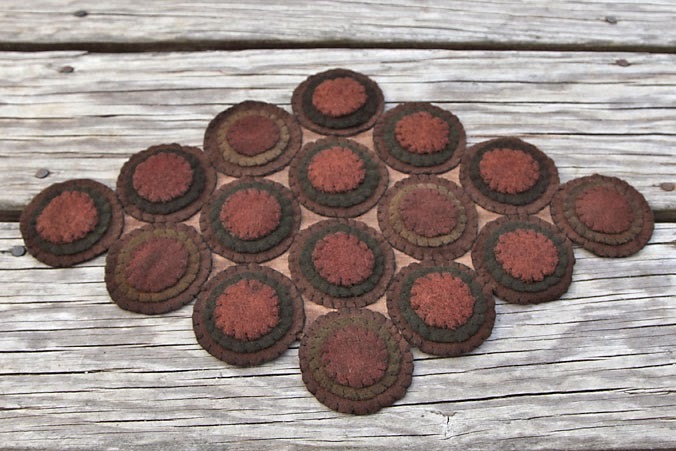 Once I had them in the layout, I used a washable marker and made dots in the middle of the areas where the pennies lay, on the outside. Then I took my ruler and connected the dots. You can also make it larger by making it more on the outside of the pennies or a complete triangle back that you can lay your pennies on, it is up to you. You can see the staining better, in this photo. I wanted the backing to be dark enough so that it blended with the pennies. I also volunteered to babysit, not like my son had to twist my arm;) We had lots of fun together and he was being quite the ham, but it wore me out. He seems to know what a camera is and loves to pose and be cute. We spent some time outside. I found a great way to keep him still so I could rest, put him on the grass. He seems to have an aversion to grass, he just sits and plays in one spot, and of course, more silliness. Then he started making this strange face and scrunching up his eyes, no idea what he is thinking when he does that, but our laughing seemed to be good reason, to do it over and over. Today I started two new projects, so I can work on the punch during the day and stitching at night, so I will be able to finish both by friday. 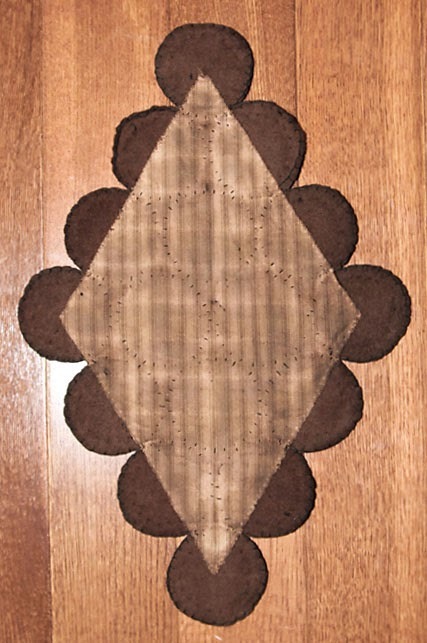 This week I noticed a few people working on penny rugs and the diamond shape, in particular. I have always wanted to do one and since I have a box of precut pennies, I thought I would give it a try. I went with the colors I had, and thought brown, green and orange were perfect for a fall piece. 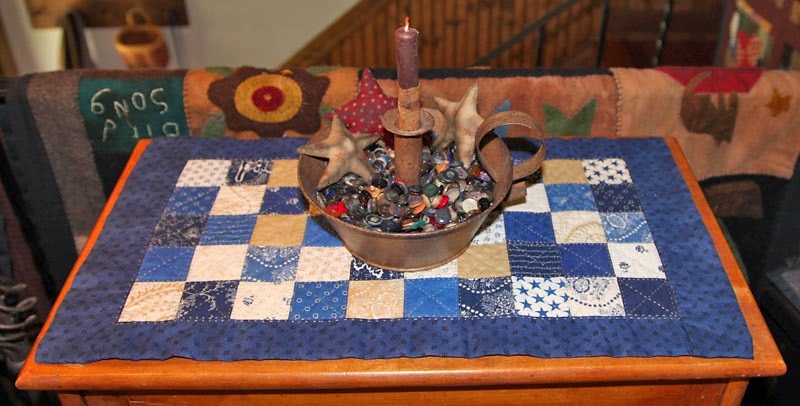 It is small so it is perfect for an end table or a candle mat for one of my bureaus. I sewed the pennies first, then I laid them out in the diamond pattern and marked off the batting so that it lay in the middle of the outer pennies. I used a piece of tan cotton ticking and sewed the pennies' outer edges to that. After I finished it, I sat it in walnut stain, overnight. It was still lighter than I wanted, so I sprayed some extra walnut ink on the front and especially on the ticking, since that was lighter. Now it is nice and dark and has an antique look. I am not sure if that shows, as well in the photo. 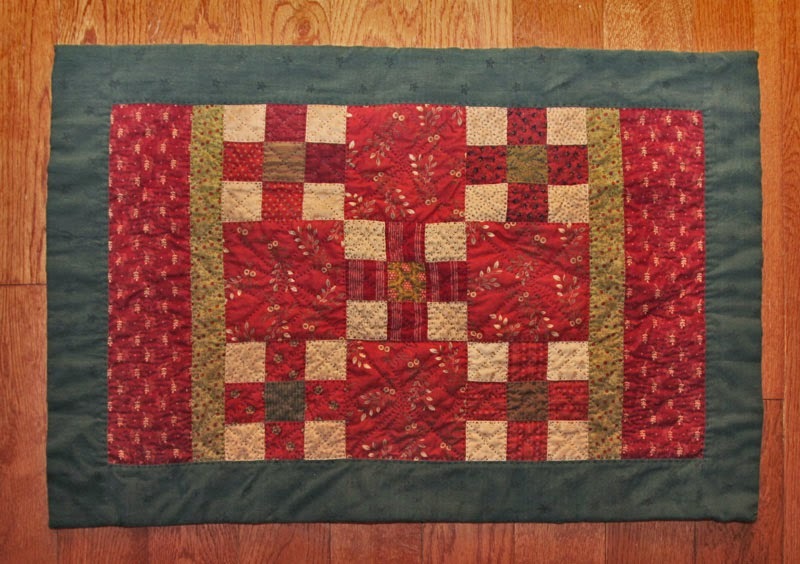 This is a fun lap project while I watch television and I think it would be fun to make some for presents, this year. 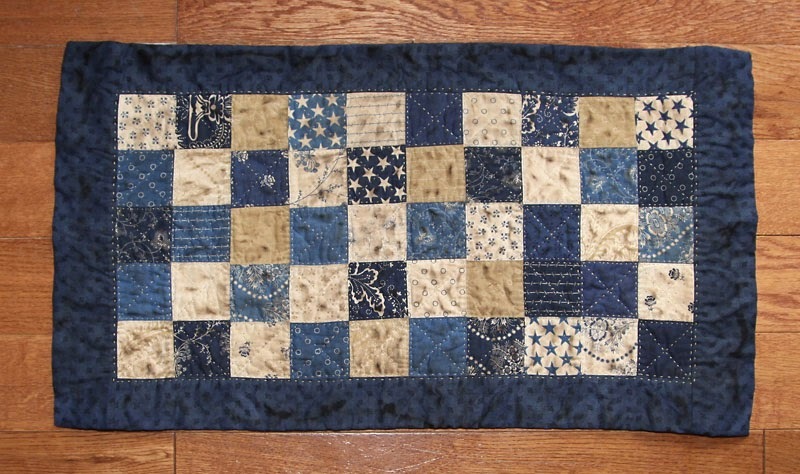 This mat is 15" long and 10" wide in the middle. You can see some of the dark staining in the photo, and in person, the ticking is a dark brown. 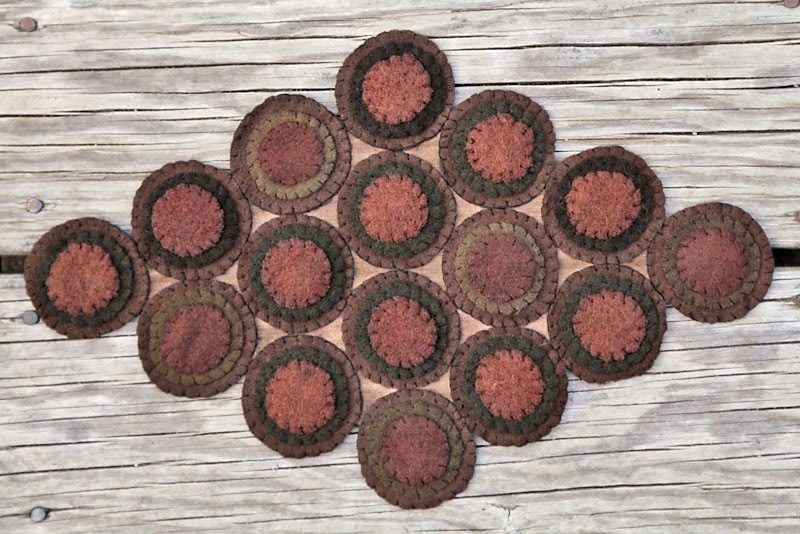 The pennies were precut, but I had to trim down the middle two circles as I went, so they are not perfect circles, but I like my pennies to be a little wonky;) A great project for the weekend and a great way to use up small scraps of wool. This weekend kept me busy. 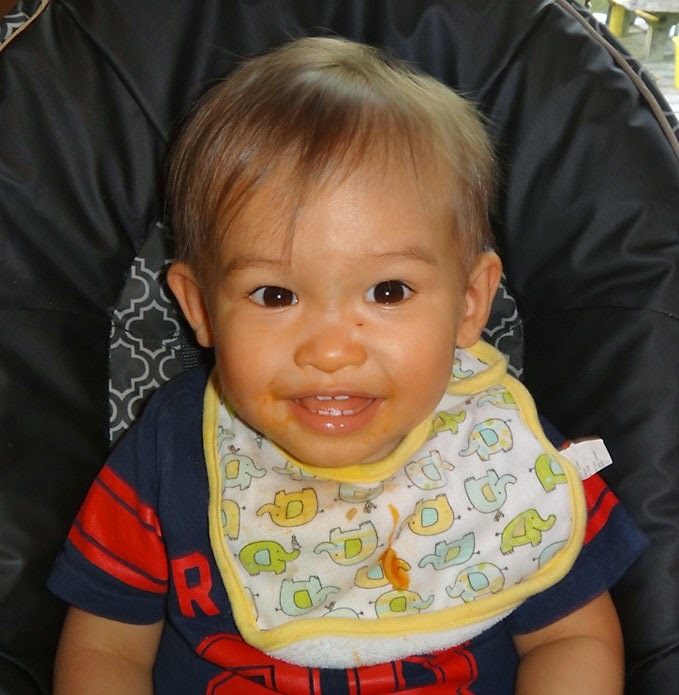 Bill had to work on saturday but my son came over and I got to enjoy some play time with Nicholas. 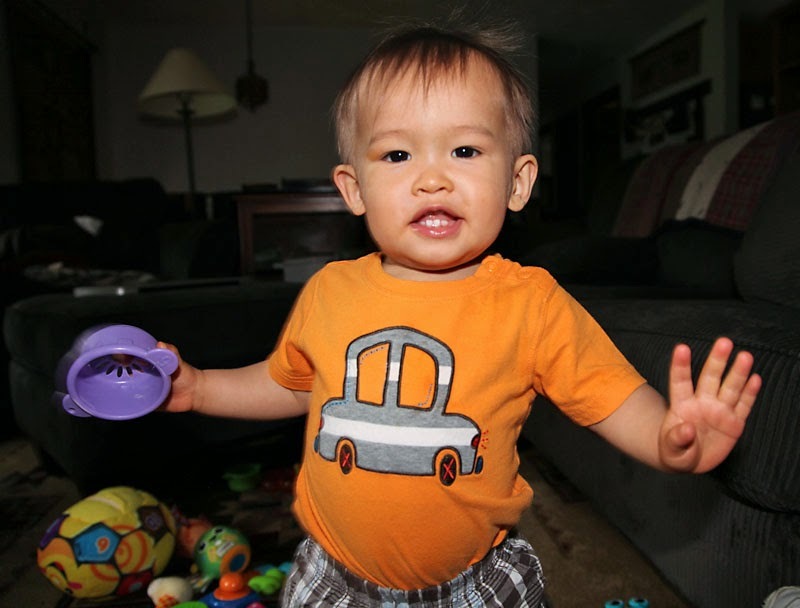 Guess who is walking now and who doesn't stay still for long, so he kept me busy running after him. Sunday we went for a paddle in our harbor. The weather was unpredictable and I didn't want to be too far from the launch in case a storm came in. It was overcast and it did rain a few times, but the nice thing was, no crowds, calm waters and cool air. 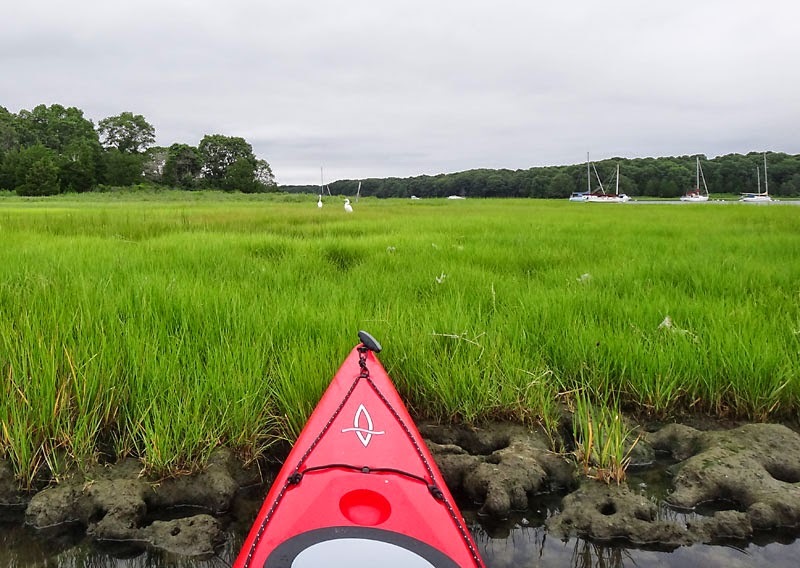 The tides were high so we could get right into the coves and enjoy the wildlife. The wild fowl loved the weather too. 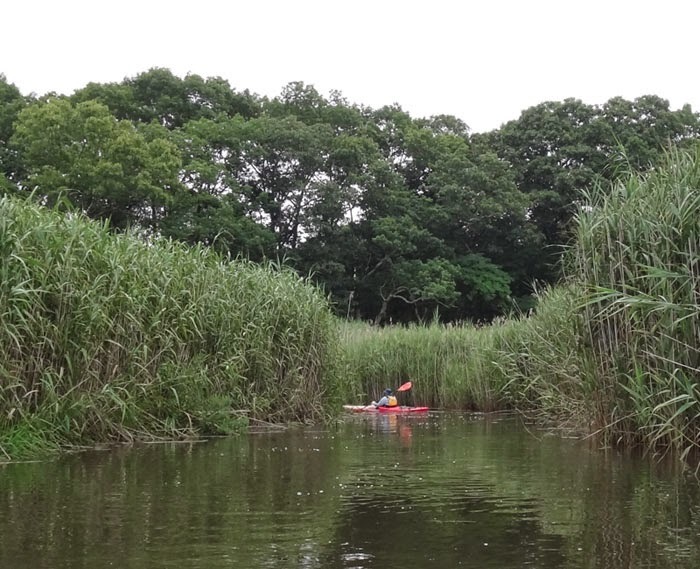 With the high tides we could go all the way into the inlets, the bull rush grows really tall in this area. Today we went out with my Brother and Sister in law. I realized after a few minutes that they are not fast paddlers, so we slowed down the pace and followed them. I was able to talk my brother into going up the to ocean and even though he was nervous, he realized how fun and beautiful it was, once we got there. I hope everyone has had a productive week and a nice weekend ahead. 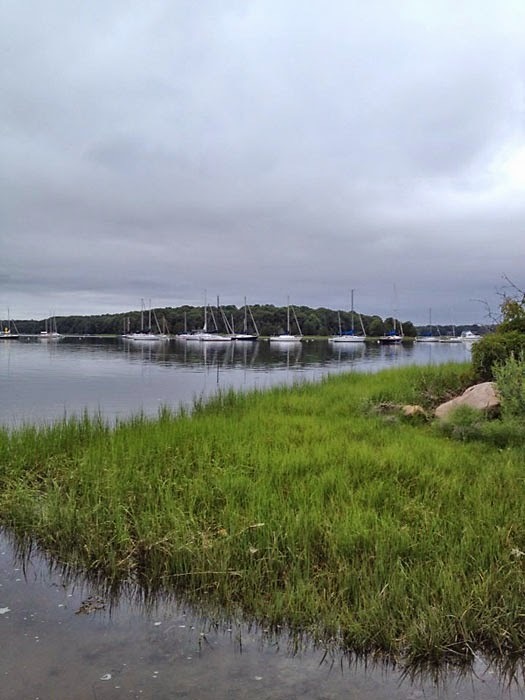 We are getting rain, I am not happy with that;) I am tempted to head west into Connecticut, the weatherman said the rain will be mostly coastal, so maybe we can find a new place to explore, out of the rain. I finished my new pattern and love how it came out. I wanted to keep it simple but with a few added touches. 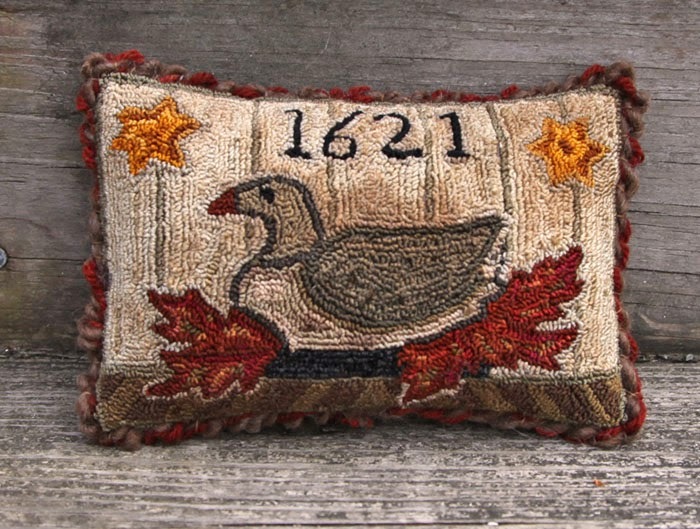 It all started with an antique duck rug, that I saw, then I started doodling and I still have a duck, but I went with a fall theme and didn't keep any of the original designs. 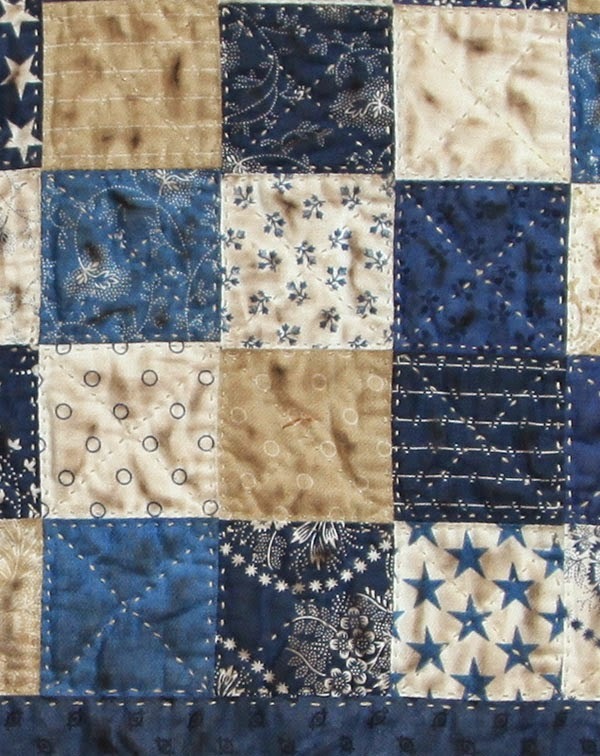 I used Dmc floss in this piece and I explain how to get the variations in the pattern instructions. I like to keep my pieces easy enough for anyone to do without having to buy specialized threads and create patterns that look nice in different mediums. I went with a pillow and it is 6 1/2 x 4 1/2". I aged it with walnut stain and bordered it with two twisted pieces of wool yarn. I had bought a bunch of vintage sears rug yarn and over dyed it, so some still has it's orange hue and works well with fall pieces. I love seeing all of the comments and your answers to my question. I didn't realize it, but it does look like he is holding a camera, lol. 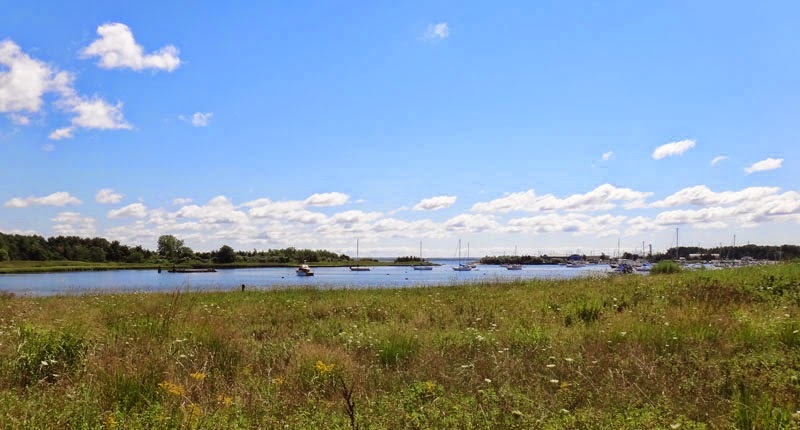 If you look closely, you will see that the shores are lined with blueberry bushes and Bill was stuffing his mouth with fresh blueberries. The winner of the giveaway is Lauren of Rugs and Pugs! Lauren send me an e-mail and let me know if you would like the new pattern of another of my epatterns, your choice. You can purchase my new pattern with the link to the left or on my ecrater site. I have also reduced the price of all of my older patterns and booklets. I hope everyone has a wonderful weekend!